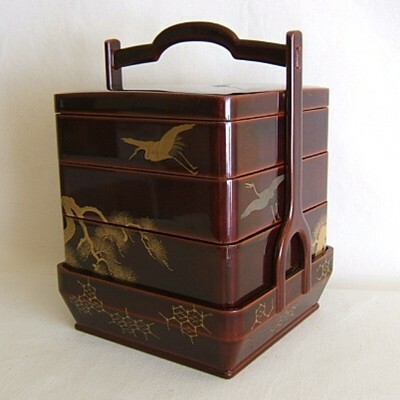 This jūbako box, equipped with a handle for efficient carrying, emerged in Japan as a device for transporting meals to elite social events, such as theatre productions or cherry blossom festivals. Jūbako boxes derived from bentō boxes, which originated in the fifth century when samurai and warriors needed to carry rice from home on long journeys. The boxes developed into wooden lacquered boxes during the Azuchi-Momoyama Period from 1568 to 1600, and meals could be served in such structures for tea parties and social gatherings This jūbako box likely originates from the late 18th century in the Edo period of Japan, when samurai became the ruling class and jūbako boxes became more luxurious, filled with sesame seeds and side dishes for upper-class recreational outings Particularly ornate jūbako boxes, often decorated with fruit or oyster designs such as the box above, surfaced during special occasions to entertain guests or host special ceremonies Lacquerware gained its value from its difficult crafting, for the lacquering process required thirty-three stages, including preparing the wood, applying powdered clay to hide the texture, and several applications of high-quality lacquer, a heat resistant material from rhus verniciflua tree’s sap. The jūbako box, complete with a striking red interior, demonstrates shu lacquer made from adding cinnabar coloring. Often decorated with gold and silver or the owner’s crest, these containers did not provide commonplace meals for Japanese masses, but served as special objects saved for holidays such as New Year’s celebrations.